Hi folks! Happy New Year. What a whopping start to 2018, a Master 11 Universal Year of Spiritual Growth and Partnerships. I will write a 2018 numerology forecast, but have been too busy surfing the waves to write about the weather, so to speak. That’s life with two kids under two! Charlie has started crawling and Forrest began talking this week. So things are hectic, however a forecast on my to-do list, I promise. In the meantime, here’s a peek at a reading I did this week. It’s hard for me to explain what I do, so telling a story might give you a better picture. I hope share more tales with you over time, as the truth is so much stranger than fiction. Client: Angel (name changed for privacy) came to see me for help with her relationship and career. She felt she was on the cusp of happiness, but couldn’t dive in. Techniques: Holistic counselling, Psychic Reading (Tarot and Clairvoyance), and Present Life/ Past Life Regression. Note: I have worked with Angel before, so it was easy for us to cover lots of ground in an hour. She’s already familiar with her numerology lifepath, personal year and palmistry etc. Find your lifepath. That’s the power of regular followup psychic readings. Result: Both my Tarot cards and Angel said that all pathways had been cleared for harmony in her love life and business, so I’m looking forward to hearing how she goes! Angel said she felt a shift and would have a lie-down to integrate what we had discussed. -I picked up that Angel’s relationship was a Soulmate connection (two dolphins appeared, which can also represent Atlantis or Sirian energies), and that her childhood idealism was an issue. I explained that the World is reflected in our body, and asked her to scan herself from top to toe, looking for the point of maximum stuckness. She identified that her legs and feet felt heavy when she did this. -We used Dissolution and Freedom technique to release the memory in her legs. This is a type of creative visualisation, where you ask questions and receive answers in the form of images and words. Anyone can do this exercise, even if they haven’t meditated. We use our minds to create pictures all the time, this is just another way to direct that ability. Angel said that the stuckness felt cold, dark, gooey and like it weighed 10 tonnes. When I asked her to imagine placing the ‘goop’ in front of her and ask it why it existed, she said it came in to ‘keep her grounded’. -We identified that when she was 3 or 4 years old, her parents told her to stop wandering around town because of stranger danger. This belief had embedded itself in her legs as a hesitation to come and go into new situations. By delving into her feelings, we found that the experience of joy had been suppressed in that moment when she was young. So we did a co-breathing exercise, to expand joy throughout her body, house, country and the Universe. After a few minutes of conscious expansion and giving her emotions space, she rep0rted feeling clear and tingly – the stuckness had disappeared from her lower limbs. -Then we did some cord clearing with Angel and her new partner (this can be down without the person present, as long as spiritual permission is gained – all psychic readings over the phone or Skype are a form of distance healing). Angel said that her partner kept reaching for her right hand in Spirit, and I asked her to say ‘I see that you admire my grip on reality. I want you to know that you have this strength too.’ She said that she felt herself yearning to touch his left shoulder, so I then asked her to say ‘I have been wanting your emotional support, however this is no longer your responsibility’. -Then she visualised putting herself and her partner in separate bubbles (representing protection and healthy auras), and using her breath to allow the bubbles to float around the Universe. I encouraged her to repeat this process anytime she felt she missed her man. By placing yourself or another person in a bubble, you honour their natural completeness and connect to them with unconditional love instead of attachment. The bubble reminds us there is nothing to fix or worry about. I’ve also used this visualisation to help people break free of bullies and forgive their parents, etc. When you can love the Soul, but correct the behaviour, all things become possible. There’s a reason I tell people ‘everything you want is on the other side of forgiveness’. This has been the story of my life. -Next, we worked on Angel’s business. When I asked her what animal her business would be if it had a personality, she said ‘a monkey’. Funnily enough, just before she answered me, I picked up a USB stick in the shape of a monkey (see cover photo). -Angel wants to open a food company but keeps swinging back and forth. She said she felt inadequate due to a lack of qualifications, so I asked her if she had heard of a particular chef I know in her area. She said ‘yes, but I never approached her’. When we looked into this, it was clear that the chef was not in the headspace to work with Angel, in fact studying with her would hold Angel back because they had different mindsets about money. -I identified that strong emotions were making it too intense to make objective decisions. We did another body exploration, and Angel said she felt fear in her stomach, so I asked permission to look into that. What followed was a brief and cathartic past life regression. Angel experienced being a 26 year old man called John, who was being laughed at by other people in a village. He was holding an apple at the time. 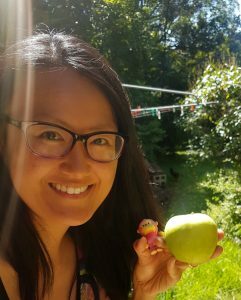 No kidding – just as I called Angel for her session, I was eating an apple, and looking at the core of it during the reading. -When I asked Angel what happened five minutes before the humiliation, she said that John had announced he was going to change the world and improve farming practices. People thought he was an idiot, so he ran away and hid in a tree. When we progressed the session, it turned out that the man never married or had children, and to his dying day felt regret for giving up so easily. This situation could have contributed to Angel’s stuckness in her legs, as our legs are our family and past life ‘roots’, aka our Base or 1st Chakra. It took effort to help John’s Spirit go to the Light, as he was still angry about what had happened. Angel: Why did I come back? Angel: How am I going with this? Angel: What do I need to be more of? Angel: What do I need to be less of? Angel: Then what is the next step? Angel: What is my boyfriend’s role in all this? It’s normal for information from Spirit (especially past life regressions) to be succinct, as it takes energy for them to talk to us and they don’t like to waste our time. After this interaction, I asked Angel’s Spirit Guides to do an energy healing on her, and bring her back into present time. We were both trembling after this as it had been a quick journey (much like ascending from diving – you can get the spiritual ‘bends’). I said to Angel that next time, we’d take it slower. She laughed and said ‘well, I always do everything to the extreme’ and we closed the phone reading. I enjoy my calling so much. It’s just a constant stream of Spirit jokes, signs and wisdom when you work with people at the Soul level, and it never gets dull. -Pick up a monkey-shaped USB stick, just as Angel was saying her business would be a monkey in personality? -Read a story about the Tanganyika groundnut scheme, seconds before Angel picked up the phone. Especially as her regression was about agricultural progress. This was a failed government program to grow peanuts in Tanzania, which caused knock-on famines – around $100 million in today’s dollars was wasted and not a single nut made it to Britain. The story was from a great book called History’s Worst Decisions and the People Who Made Them, by Stephen Weir (I’ve been doing numerology on the people mentioned, just for fun). -Go back to making green smoothies 48 hours before Angel’s reading, then found out she had just started a liquid diet? -Post about Spray-free Farmacy and their organic fruit and vegetable deliveries in Brisbane on Instagram this morning? -Suggest my 11:11 Soulmate Kris go to cooking school (because he is such a great chef), 48 hours before I talked to Angel about her similar business idea. In fact, all week I’ve been thinking about how cooking reveals our willingness to think – those who like cooking, are often more entrepreneurial and better at making ends meet under pressure. Test my theory – go and cook something new this week, it will get your happiness flowing in so many ways, including financially and emotionally. Before I talk to a client, I tune into their energy, between a few hours and a few days before. Even then, I’m always surprised at how accurate my Spirit Guides can be. They sure know what’s what! Sometimes I feel like I’m on the Truman Show. Synchronicity is my middle name these days. I don’t need to watch TV anymore, because my life is a comedy-drama that just keeps getting better. That’s the joy of living the 11:11 dream. You reach your highest potential and help countless others to do the same. 11:11 means, it’s time to go up in vibration! We are all one energy, reaching for the light. Thank you Angel and all the energies who helped, for your help and inspiration today. Caroline Byrd – My Soul Sister and Psychic Mentor Since 2009 – I had a session with her recently, and she’s pure gold! Love her so much.